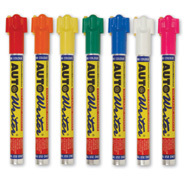 KARN Automotive Auto Dealer and Detail Supply - Paint Pens and Markers Paint Pens Autowriter Wet Erase Markers Rain resistant, wet erase marker for use on nonporous surfaces, glass, painted surfaces and more. Easily removed with glass cleaner. Great for body shops and car dealers. Sold individually. Rain resistant, wet erase marker for use on nonporous surfaces, glass, painted surfaces and more. Easily removed with glass cleaner. Great for body shops and car dealers. Sold individually.